In May 2011, it will be two years since the United States Army Corps of Engineers called URETEK ICR Gulf Coast to assist in an emergency stabilization of the Addicks and Barker reservoir outfall structures. 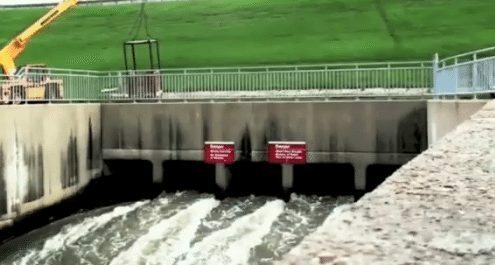 Addicks and Barker reservoirs play an integral role in flood prevention for the city of Houston and surrounding areas.These reservoirs feed Buffalo Bayou which flows through downtown Houston into the Gulf of Mexico. Both reservoirs, constructed in the 1940’s, utilize outfall structures that consist of a series of concrete conduits that control floodwater elevations.Through decades of service and city growth and development, the outfall structures have undergone modifications to sustain additional water containment and flood control.The constant turbulent outflow and pressure associated with yearly volumes of water passing through the conduit system, soil erosion and unseen voids are major threats to the integrity and mission of Houston’s reservoir system. A previous inspection of the outlet structures by the US Army Corps of Engineers (USACE) revealed large voids and water flow beneath the culverts. The alarming size and volume of voids combined with the recent record water level, the USACE issued an “Urgent and Compelling” status associated with both the Addicks and Barker reservoir outlet structures.The “Urgent and Compelling” status meant that due to the substantial soil erosion that undermined the integrity of the concrete conduits, the risk of failure was extremely high for the outfall structure. The USACE considered multiple repair options but determined that the constant water flow through and beneath the structures would not allow for traditional, high impact and vibration grouting methods.Reservoir water levels prohibited outlet shutoff for an extended period to allow for complete conduit replacement.Most importantly, the undetermined size of voids and water flow occurring under the outfall structures had to be determined and remediated to re-support the structure to ensure safety for the city of Houston. In a highly saturated, moving environment, traditional grouting techniques were at a disadvantage because the mix would immediately be off ratio once introduced to the high flow rate of reservoir water.Second, a considerable amount of tonnage would be introduced on top off the already distressed, base soil. USACE chose URETEK, a company that utilizes a unique, innovative, expanding polymer that can be injected into saturated environments to stabilize weak base soils under heavy structures. URETEK’s custom structural polyurethane, was designed exclusively for URETEK applications by Bayer Material Science. Bayer’s exclusive polymer was ideal for the conduit application due to its extreme light weight (4lbs. cu. ft. free rise) and ability to maintain structural and compressive strength after injected into saturated soil. Bayer Material Science formula for URETEK’s expanding polymer have a chemical composition that allow for direct application into water.The polymer is inert, non-toxic and its monolithic nature ensures that the material will not be subject to underground water erosion or weakening while its high-density composition provides ample physical strength characteristics to maintain structural support of even the heaviest foundations.Bayer Material Science formulated polymers are introduced into the environment as a liquid, quickly expanding to form a solid; this allows the material to penetrate deep into voids and through unconsolidated soils to allow maximum compaction and densification, with very little weight or excavation necessary to achieve desired results. URETEK completed both the Addicks and Barker outfall stabilization projects as specified by the USACE in less than three weeks. Post construction testing revealed greatly improved soil properties.Testing also revealed that compacted soil, high-density polyurethane, or a combination of the two now existed where voids had been detected; indicating that these structures were now properly supported as intended, by the underlying strata. After URETEK’s injection process was complete, the “Urgent and Compelling” status was lifted by the USACE after engineers determined the outlet structures were structurally stable, safe, and capable of staying in service for the city of Houston and surrounding communities.